Fast Fashion: What are we supporting every time we get a ‘deal’? A brand that you know and love may be a culprit of fast fashion. Many people are not aware that their wallet-friendly purchases at big fashion chains have a great effect on human trafficking, the quality of employee working conditions, and the environment. The industry is responsible for adding to human rights issues, and promoting the use of forced and child labour. Can you imagine an 11-year-old working overtime in an unsafe environment to make your sweater? It’s a harsh reality but it’s happening. The environment is also at risk due to toxic chemicals that are leaking into soil and water. You may think you’re wearing 100 percent cotton but you’re also wearing some damaging chemicals. Since many are unaware of the truth about fast fashion, I’m here to share what I know so that you are educated on the industry and its harmful effects on humans and the environment. To put it simply, fast fashion is a term used to describe the process in which designs move quickly from catwalk to retailers. In a time where we want what we want, when we want it (and we want it now! ), it is important that the clothes are manufactured quickly and inexpensively. This way the consumer can have the item in their hands as soon as possible and for as little money as possible. They sure are right about one thing—lives and fortunes can be changed forever. It’s not only the designer’s lives though, it’s the millions of innocent people who are going to be forced to work long hours to produce these items in dangerous and dirty conditions. Televisions shows like this can single-handedly promote the fast fashion industry. So now that you know a little more about the dark side of the fashion industry, let’s talk about it’s harmful effects. One of the last things consumers are thinking about as they sift through racks of polyester and cotton-blend dresses is the environment. However, that may change if they knew that the manufacturing of fast fashion is the second largest polluter in the world next to the oil industry. These clothes are being manufactured in a quantity over quality world and therefore, the item is not made to last and disintegrates after just a few washes. The item, which is made of non-biodegradable materials, is then disposed of, increasing landfill capacity. Because the product is so cheap, consumers just go straight to their local mall to purchase the item again – demand increases and a deadly cycle is born. Cotton—a fabric we all know very well—has its dirty little secrets as well. According to the World Wide Fund for Nature, it’s a thirsty and chemically dependent plant. The t-shirt and jeans you’re wearing needed over 5,000 gallons of water went into producing them for your wear. Although cotton makes up only 2.4 percent of the world’s crops, it is responsible for 24 percent of global insecticide sales and 11 percent of global pesticide sales. The unsustainability of cotton farming has already proven to devastate ecosystems. For example, NASA states that the Aral Sea in central Asia has been filled with so many harmful pesticides and chemicals that water levels are drastically lower than they were 50 years ago. With a dry sea, the communities and fisheries that depended on it diminished. Contaminated dust from the newly exposed lake bed collected and was carried through the air, creating a public health hazard as well as further harming the soil it landed in. Bodies of water that large also have a great effect on the climate and with the loss of such a body of water, winters grew colder and summers grew hotter. Now let’s talk about dye. As mentioned before, after you buy a new shirt at a fast fashion retailer and wash it a few times, you may notice fading in colour and deterioration of the fabric. But before you decide to hold off on the washes to get a couple more wears out of the shirt, you may want to know that it’s actually saturated in harmful toxic chemicals such as nonylphenol. This harmful chemical, which was exposed in Greenpeace’s report, “Dirty Laundry 2,” could be linked to cancers and allergic reactions. Nonylphenol is also bio-accumulative, meaning that it builds up in the body and unfortunately we don’t yet know what that means for our health. Although strictly forbidden in Europe, the clothing manufacturers responsible for carrying this chemical are often produced abroad in locations with few to no relevant laws. By the time it is washed out of your clothes, your items have completely fallen apart, giving you no other option other than to throw it away. With thousands of stores worldwide in a fast fashion chain, just think of how many items have to be manufactured to keep those stores in stock. With such a high demand for clothes, it is hard for the factory workers to keep up. Producers are desperate for more workers and will not stop at anything to get what they need. With practically no labour laws, crimes such as child labour and human trafficking are extremely common. Many companies deny the use of human trafficking because it is often hidden so well. These scandals were exposed in Stephanie Hepburn and Rita J. Simon’s book, “Human Trafficking Around the World Hidden in Plain Sight.” In China, government-sanctioned work-study programs acted as alibis for supplying school children to factories for forced labour. Dangerous conditions and overtime were the only options for these children who were provided with fake identification in order to appear older. The Longfa Shoe Factory, owned by Dean Shoes Co. Ltd., a supplier of Nike, is just one of the many offenders of forced child labour. Why do these people subject themselves to such torture, you ask? The cost of living often exceeds the salary of the factory workers and they have no other choice but to become a victim of human trafficking or forced labour. Companies often rely on the factories they work with to do all their sourcing of materials. And because they do not have day-to-day contact with these factories, they have no idea who is actually making their clothes. After the tragic Bangladesh fire, efforts such as the Bangladesh Accord for Fire and Building Safety and the Alliance for Bangladesh Worker Safety were formed by European and American brands respectively. However, U.S. News reports that both groups have failed to keep up their end of the bargain. 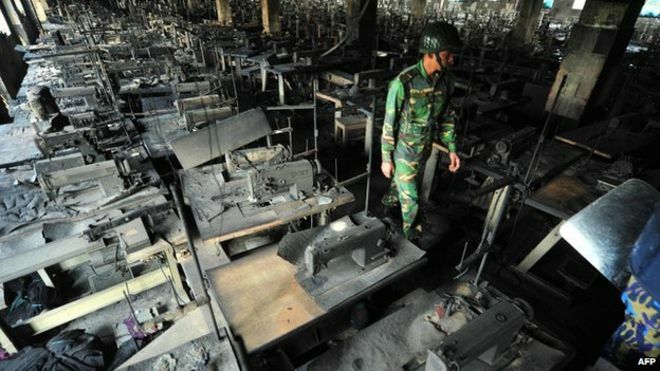 Therefore, Bangladesh’s nearly 2,000 factories have not been inspected and repairs have not been overseen, meaning that 2 million workers are at high risk of facing another tragedy. Now that you are more aware of the horrors of the powerful fast fashion industry, you can make smarter decisions when shopping. Thankfully, there have been many efforts to combat the harmful issues resulting from this industry by slow fashion companies such as Treasure Box Kids who have made it their mission. Treasure Box Kids takes sustainable manufacturing very seriously and keeps this in mind with all current and future manufacturing efforts. Remember, any small effort against the fast fashion world could help save a life or even the environment. Forget fast fashion—check back next week to learn more about the sustainable efforts of the slow fashion industry. Carolyn Bailey founded Treasure Box kids, an online retailer for kid’s fashions based in Orlando, FL. in 2006 and has since dedicated her time to manufacturing and selling clothes that are high quality and ethically made. Treasure Box Kids features two lovely lines, “Treasure Box Kids USA by Carolyn Bailey,” which is manufactured in the USA and “Little Maisha,” which benefits victims of human trafficking. “Little Maisha” allowed Carolyn to launch efforts to help educate and employ Kenyan women, ultimately preventing them from becoming human trafficking victims. Through Carolyn’s passion, leadership and experience, Treasure Box Kids has emerged as an expert in the children’s clothing industry. For more information about Treasure Box Kids and its cause, please visit www.treasureboxkids.com. This entry was tagged bangladesh, change the world, Child Labor, ecofashion, environment, ethical consumption, ethical fashion, ethical fashion brands, fair trade, fashion, garment factory, garment workers, how to shop ethically, minimalism, reuse, Shopping ethically, slow fashion, sustainability, sustainable, sustainable fashion. Bookmark the permalink. Carolyn , a good post explaining all effects about fast fashion and consequences of the customer choices. As outlined in the post it is important consumer must be able to make “nformed buying decisions. There is nothing better than coming from work and reading your blog!